The purchase of the resorts by Mammoth is a done deal as of last Friday. With fresh snow last weekend, we may see plenty of folks up here so, think about taking another route up the mountain. Here is a link to DOT website for road conditions. The most popular way to Big Bear is highways 30/330 from the San Bernardino area. Try the back way from the high desert which is Hwy. 18 from the Victorville/Lucerne area or Hwy. 38 from the Redlands area, these are less traveled and might be a little longer trip from your starting point but less cars may make for a better journey. The 38 is a really nice drive (my favorite) but, does have more shady areas so, be on the look-out for black ice. 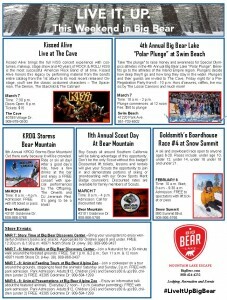 See you soon and check out all the Big Bear events this weekend.